John Howard was a Niagara pioneer when he opened Vineland winery a couple of decades ago. The stunning location on the mountain in Beamsville is still one of the area’s main attractions. Howard sold out early on and went into semi-retirement, but now he’s back in the business (next door to Vineland) with a new winery called Megalomaniac. Named after himself, of course. Megalomaniac is a classic cellar door winery, but this is no ordinary cellar. John owns a chateau in Bordeaux and has brought French sensibility and splendor to his Niagara winery. For sure, a must visit. Sue-Ann Staff makes the wines here, and also at her own winery close by. The first Megalomaniac wine at the LCBO is a white called Homegrown. 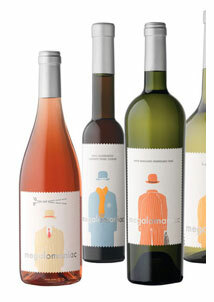 It has the bowler-hat-guy label of all the other wines, but this time the suit is a Niagara map showing the vineyard location. And just in case you don’t get the message that the wine is homegrown, the bottles neck has a sticker saying ‘100% grown by Grape Growers of Ontario’. The wine is off-dry, low alcohol with the easy drinking character of Riesling. Summer patio sipper. P.S. One of my favourite local Rosé of the season (so far) is MEGALOMANIAC 08 ‘Pink-Slip’, VQA Niagara. Gorgeous red berry flavours and a little creaminess mixed with refreshment. A hard-to-put-down glass. At the winery only $14.95. An excuse to visit. Previous articleDoes the VQA symbol work?